Morina´s corner threw in the towel. The normally durable Gierke was floored in both rounds and took a beating. It was cruiser vs supermiddle in this one. Polyakov showed a good left hook / upercut but Rossing was too big and sharp. A right-left hook combination put Polyakov down on his back and while he got up it was stopped. Polyakov also picked up a cut by the right eye seconds into the fight. He had trained in Aarhus for a few weeks sparring with Jeppe Morell, a southpaw. Excellent fight! Poulsen outboxed Garrido, who kept coming. In the seventh Poulsen was exhausted and in the eighth he just ran but won clearly on scores of 78-74 on all cards. Garrido was cut by the right eye apparently by a headbutt from Poulsen. The Frenchman was cheered on by his wife and two kids at ringside and as usual gave his all. Stephanie Ducastel was a no show at the weigh in and had apparently been pulled - or been told to pull out by someone - later Friday night Caballero accepted the fight. Caballero was brave but outclassed and was floored in the third and fourth and took a beating along the ropes when it was stopped. More misses than hits in this one. Acosta was down in the third but it was more a stumble than a punch that caused it. Morell, a southpaw, fought a disciplined fight but showed bad timing but still it was a good win for him, 80-73, 79-72 twice. Kotosovs looked fragile but proved to be tough and gave Meng a good fight but eventually the Dane broke through and it was stopped. Earlier in the fourth the Latvian had a point deducted after losing his mouthpiece for the third time - at the time of the stoppage he lost the mouthpiece a fourth time. Murjikneli opened up late in the first and Mahfoud was in trouble but as it was the Georgian punched himself out and by the third he took a beating. The stoppage in the fourth looked a bit premature but Murjikneli was in trouble. Prodebut for Mahfoud, brother of Sarah. 39-37 Mezei, 39-37 Nadim and 38-38. I had it 38-38. Prodebut for Nadim who was slow and plodding but quite strong and kept coming but failed to let her hands go. When ECB had to cancel the Luebeck show (Murat vs Fornling) they quickly replaced the undercard fighters to various shows - including a free entrance gymshow. The overweight Georgian retired after four rounds of glorified sparring (and just when Hammer turned up the heat). Gogishvili went over twice in the first and again early in the second and it was stopped when he got up. 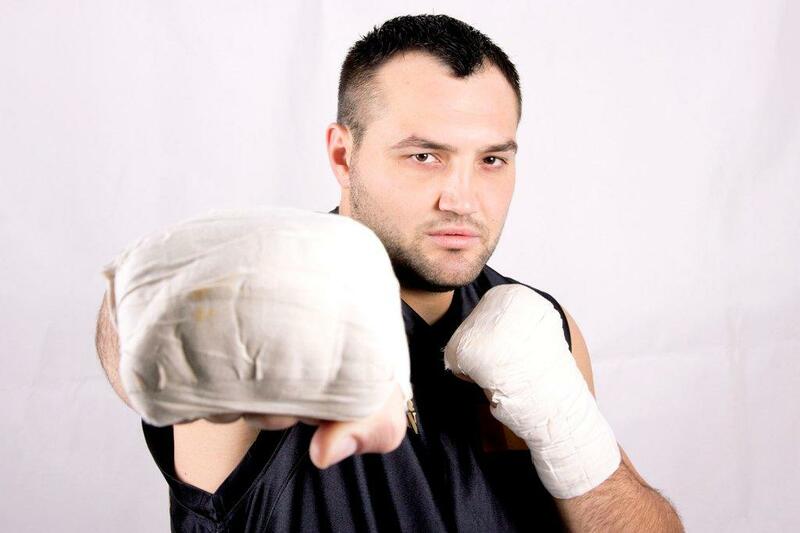 "Real" prodebut for former AIBA pro Pfeifer. Stein, a green debutant, hurt his arm early, sat down, was given a count - and medical treatment - and the fight resumed. Stein poured it on but then the arm hurt again and this time there were no rescue and it was stopped. One sided but the bulked up Milalic couldn´t hurt Janjanin. Schwarz retained the WBO I/C title with ko over an unknown opponent. WBC Int´l Silver title - scored 117-113, 117-112 and 118-110. WBC Int´l and an eliminator - and a controversial one. Mock was down in the first and was behind after four but closed the gap and in the ninth he floored Yildrim but no count was given. It was scored 1116-111, 113-112 and 113-113. Referee was Manuel Maritxlar, who speak very little English. Both had a point deducted in the eleventh for failing to listen to instructions. Kanguel steps in for Ronny Mittag who stepped in for Toni Kraft. vacant BeNeLux title at middleweight. Diagne lost his mouthpiece (! ), had no extra and was dq:d.
This loss cost Jur his mandatory spot for the EBU title. 39-37 Plemenichenko, 38-38 and 40-36 Kuzmenkov. 40-35 on all cards. Kenjegaliev down in the second. Baranyi retired after eight hardfought rounds and didn´t come out for the ninth. Kis retained the national title. Swierbinski won the Polish title on scores of 96-94 and an out of line 99-92 for Swierzbinski and 96-94 Jackiewicz. WBO and WBC Diamond female superfly titles. 60-53 on all cards. Ataev down in the first.